With the rise of cheap VPS (Virtual Private Server) services and the increase of complexity in the architecture of new web applications, deployment processes are becoming a very important topic and a skill to master to some extent. Long gone the days when we just needed a cheap hosting service and an FTP access to be able to setup and update our static websites. Furthermore, it is worth considering that software development has become a lot more collaborative thanks to tools like Git and services like GitHub and therefore people are getting used to the benefits of versioning. This brought in the idea of being able to keep our deploys versioned as well and to be able to roll back to a previous version easily in case a new deploy ends up to break something. In this article, we will learn how to set up a VPS (or a test virtual machine) to serve a static website with Nginx and how to create a simple yet effective deployment process to keep our website updated. Of course we will take care of integrating versioning and rollbacks in the process. I am assuming you already have a basic knowledge of Bash, Git, SSH, and Ubuntu but I will try to make things as clear as possible so that, even if you are a newbie, you should be able to understand and follow the tutorial. Also, you will need to have Git and NodeJs installed on your local machine. The first thing to do is to have a server machine that we will need to be configured to serve our website. My advice is to get a basic VPS on DigitalOcean or Linode. It will cost you very little money ($5-10/month) and you can shut down the machine once you are done with the tutorial and save the money for when you need to serve your next real website. As an alternative, you can also use a local virtual machine to simulate a remote server. In this case, my advice is to go with Vagrant. In case you want to go with the local virtual machine option here’s another guide for you to get started with Vagrant. So, just to make things clear, we will work on two different machines. The local machine (our computer) for development and the remote machine (our server) as production environment to serve our website to the World. All the next paragraphs will be labeled with “(local)” or “(remote)” to make clear where we will perform our actions. If everything went fine we now have Nginx installed. If you open your browser and visit http://yourserver/ (where yourserver is the real IP or the domain name of your server) you should be able to see the default Nginx welcome page. We will change that later with our real website. For now, our server is ok, we will see in a moment how to configure it for our needs, but let’s create a new website on our development machine first! In this paragraph, we will create a very simple website and start to version it using git. For the sake of simplicity, on our website, we are going to have two files and a HTML home page and a CSS file. As a starting point, our css file includes Normalize.css, an open source stylesheet crafted to minimize the differences in the way different browsers handles some properties. It helps web designer to obtain the same graphic layout through all the major browser. So if we want to see how our new amazing web site looks like we just need to open our index.html. git commit -am "first version of the website"
At this stage our git repository lives only on our local machine, so nobody will be able to read it from the outside, neither our server will be able to download the files when we want to release a new version of the project. To be able to collaborate on any Git project, you need to know how to manage your remote repositories. Remote repositories are versions of your project that are hosted on the Internet or network somewhere. You can have several of them, each of which generally is either read-only or read/write for you. Collaborating with others involves managing these remote repositories and pushing and pulling data to and from them when you need to share work. So now we have one problem: where do we have to put our remote repository? The easiest solution is to get an account on GitHub and create a new public repository there. GitHub is free to use for public repositories, but you can purchase a paid account to have private repositories in case your repository contains sensible information that you don’t want to share. Let’s add a name and a description, be sure to select public and click the “Create repository” button. As you can tell, our project file are not there yet, let’s push them! Be sure to replace with the URL you copied from your GitHub repository page. 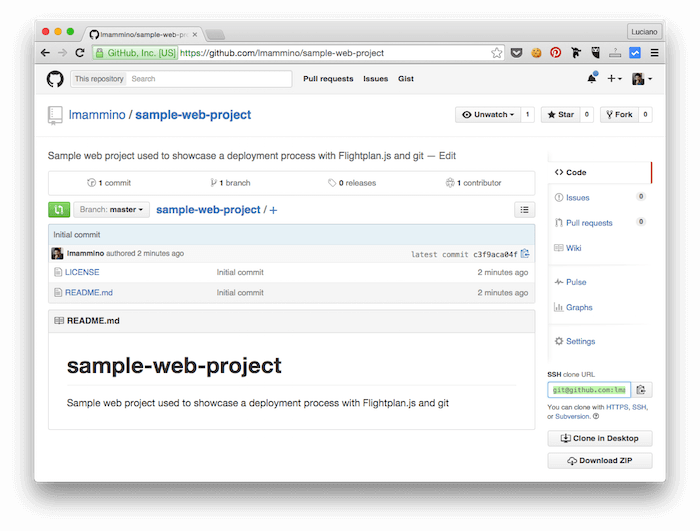 If you refresh your GitHub project page, you will now see all our project files are there. We now have our website and our server and at this stage we can move to the core of our article: how to organize a process to simplify the deployment of our website in the new server. There are hundreds of tools and SaaS platforms to manage complex deployment processes on one or more servers, but one of my favourite is Flightplan. 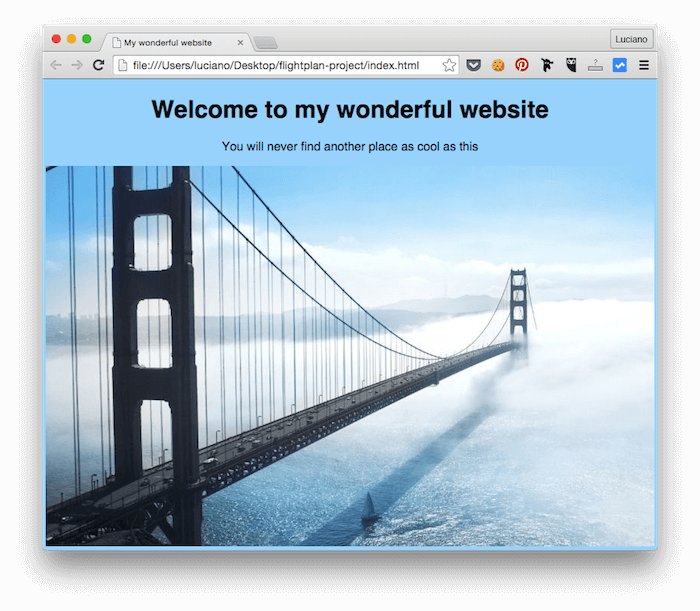 Flightplan is a NodeJS library that can be easily installed and configured to create a sequence of shell commands in our local machine and in our remote server to deploy and update our website or app. 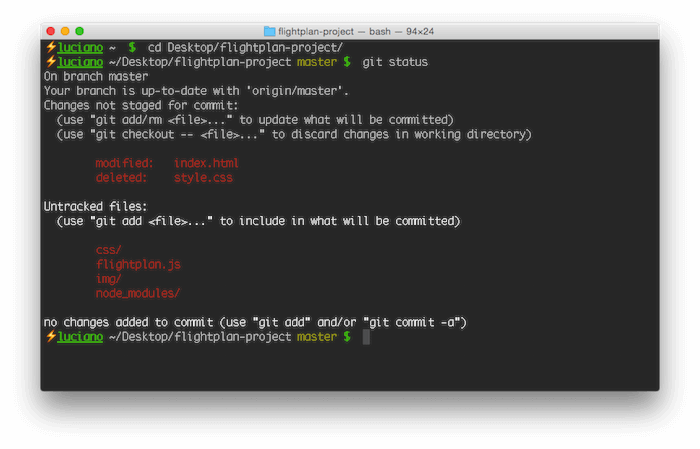 The first command installs Flightplan as a global command (the fly command) in your system, the second one allows us to use the Flightplan library inside your project. 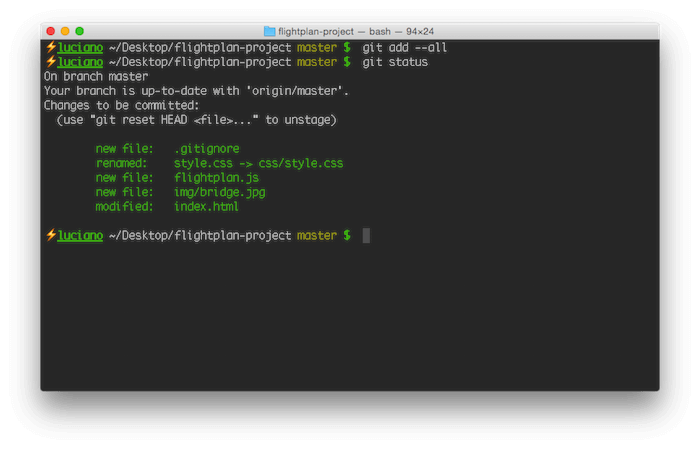 Now we need to create a configuration file inside the main folder of our project called flightplan.js. Before writing the code in our Flightplan configuration file let’s understand what exactly we want to achieve and how we want to structure our files and folders to do so. As we said, our objective is to be able to deploy a new version of our website with a single command and to be able to rollback to the previous version just by launching another command. So we expect to have at least two different commands: deploy and rollback. repo: a folder used to download the data (clone) from our git repository. It will allow us to download only the data that changed since the last time we deployed, so it will be really efficient. versions: in this folder we will have different subfolders, one for every deploy. current: a symlink to the last deployed version in the versions folder. It’s the folder that will be used to configure Nginx and the only one that will be shown online. Furthermore we want to add a nice feature to save disk space: we want to have a fixed numbers of deployed versions on the server (e.g. no more than 10), so we might need to delete the older ones at the end of every deploy. * Remote configuration for "production"
It’s a lot of code, let’s analyze it piece by piece. The remote configuration defines our production environment on our server and tells Flightplan how to connect to it and what the specific options for the server are. In more advanced setups you can also specify an array of servers to which the deploy will be carried simultaneously. As you can see there are some configurations that you will need to change, like: host, username, password (probably not required), webRoot and repository. The setup command is a helper command that you can launch once to configure the remote machine folders. The command remote.hostname() is a debug function that prints the hostname of the server the script is currently in. I recommend to use it, because if you need to switch to a multi-server environment it will be very useful to follow the output of all the servers. In the next lines we first create our web root folder, then inside that folder we create the versions folder and we clone our repository into the folder repo. The first thing we do is to update the repo folder pulling all the new stuff from our repository. Then we execute the date +%s.%N bash command that prints out the current timestamp in seconds and milliseconds (e.g. 1441459969.874386446). This will be the id of our new deploy. At this stage, we simply copy the repo folder inside the versions folder using the new version id as folder name (e.g. versions/1441459969.874386446). To finish the process we symlink this new folder to the current folder. We also take care to assign these files to the user www-data so that nginx will be able to read these files. Then we clean up the old deploys using a handy bash short-liner command. The command lists and removes all the folders in the versions directory skipping the first n, where n is the number of deploys that we want to keep. The rollback command allows us to restore the previous version and to delete the newest one, it’s like a step back in time. What we do here is to use another bash short-liner to get the last 2 deployed versions inside the versions folder. The first one is the newest one, the second is the one we want to rollback to. Then we simply symlink the second to the current folder and delete the first one. Ok, now that we have all our Flightplan commands ready we can launch off the first deploy. If we have done everything correctly our deploy should be successful and show a green dot! But wait… why our server still shows the default nginx page? Oh well, we still need to configure nginx to use our current folder! This will open the nginx configuration file with the nano editor. Move the cursor down until you see a server block definition and look for the root property. There should be the default nginx page path in there, just replace it with the path of your current folder (e.g. root /var/www/mywebsite/current;). Then you have to save the file with ctrl + o and exit with ctrl + x. Now get back to our website and refresh! Tadá! Our web server is now serving our new website! Cheer up! I know, I know… it looks like one of that websites from the early ’90s, but let’s pretend it’s wonderful and we want to deploy this new version for now. There are some things to review here. First of all we moved our css file to the folder css so git thinks we deleted it. We also changed our file index.html, then there are some new files and folders that we need to add to the repository. The node_modules folder disappeared and the new .gitignore file is waiting to be added to the repository. git commit -am "Added picture and background color"
We should see a bunch of lines of output and then a green dot that confirms that our deploy went fine! Great, let’s now refresh our website page in the browser and see that our new version is online! Let’s refresh your browser and tell our friend he was right! In this article we learned a lot of useful things about how to keep our website versioned and how to deploy it easily. 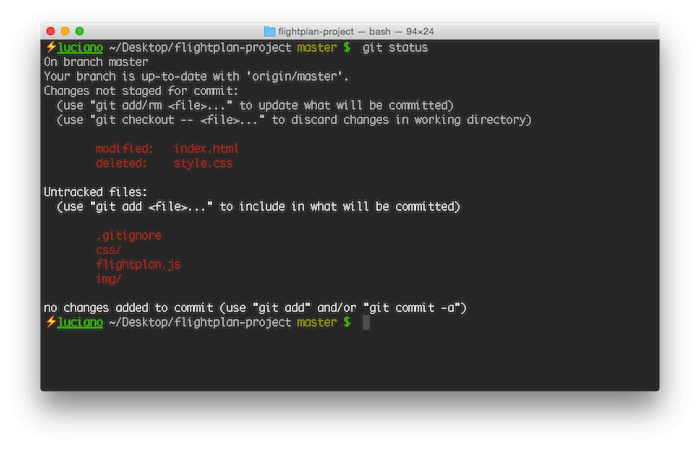 We used a bunch of interesting tools like git and Flightplan. The article was focused on explaining the basics of these tools. You might have a dynamic website written in Php or NodeJs rather than a static site so you might need to add more steps to configure your remote server and your deploy process. 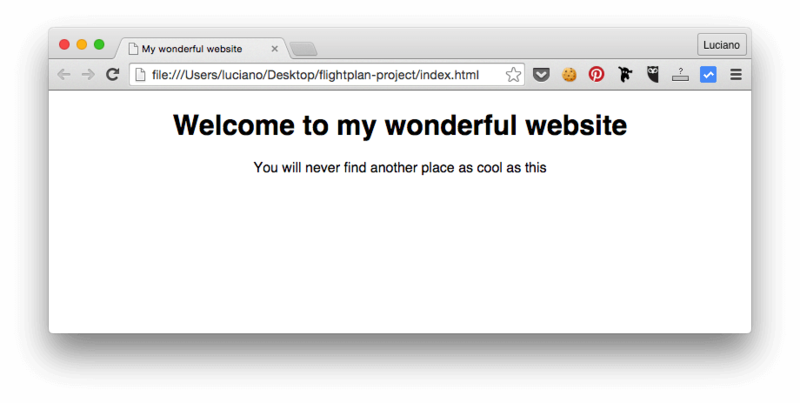 Anyways, it shouldn’t be too hard now that you have a boilerplate to start from. I hope the article was useful, I really hope to hear your opinions in the comments below! 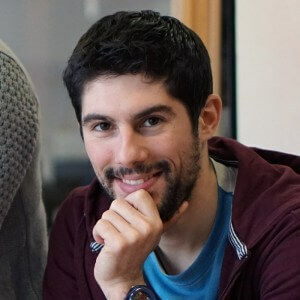 Luciano is a Software Engineer born in 1987, the same year that the Nintendo released “Super Mario Bros” in Europe, which, by chance is his favorite video game! This article is brought to you by Usersnap. It’s your central place to organize user feedback and collect bug reports. Report bugs in your browser, and see the bigger picture. Get your 15-day free trial now.